As more states legalize medical marijuana, they are faced with the question: Can employees be fired for legally using the drug? (CNN) -- When a rare form of cancer invaded Joseph Casias' nasal cavity and his brain, his doctor prescribed marijuana to help alleviate the daily pain. Casias lives in Michigan, where medical marijuana is legal. But his employer, Wal-Mart, the nation's largest retailer, fired him in November 2009 after he failed a drug test. Casias, 29, says he never came to work high. He's got a medical marijuana card to prove he's allowed to smoke legally in the state. "I was angry they did this to me because I always tried my best," said Casias, who was employed at Wal-Mart for five years. He earned an Associate of the Year award in 2008. "I want my job back. I thought I was part of the Wal-Mart family." To date, 14 states have laws allowing the use of medical marijuana, which shield legal users from criminalization but don't protect them from them penalties enforced by their employers. As more people are being prescribed marijuana across the nation, they are wrestling with a caveat: They could be fired. Without laws defending medical marijuana users from employers' drug policies, Casias and a growing number of medical marijuana users are being let go from their jobs, says Keith Stroup on the legal counsel team of the National Organization for the Reform of Marijuana Laws. He said his office, headquartered in Washington, receives about 300 e-mails and phone calls a year from medical marijuana users who have been fired or had job offers rescinded because of a failed drug test. "Usually they talk about how they have lost their job," Stroup said. "And I tell them there's not a thing they can do about it." There is no national estimate of how many medical marijuana users are at risk of being fired -- or of not being hired -- for using the drug as part of their treatment. Many employees, who have been fired for using doctor-prescribed pot, often remain quiet because they fear the stigma or threat losing their next job opportunity. In California, the first state to legalize medical marijuana, 37,000 medical marijuana cards have been authorized since 2004. In Michigan, where Casias lives, the Department of Community Health reports about 10,800 people have medical marijuana cards. Michigan is an at-will employment state, which means employers can terminate a worker for any reason except for being in a federally protected class such as race, gender and religion. But medical marijuana users are not considered a protected group. If a company has zero-tolerance drug policies, then they can fire someone who uses medical marijuana, attorneys say. Labor law experts say most states operate this way, unless the employee has a specific employment contract that makes exceptions for medical marijuana use. In 2008, the California Supreme Court backed up employers, ruling a private company could fire an Air Force veteran whose doctor prescribed him marijuana for his chronic and disabling back pain. The veteran was hired by a telecommunications company but fired several weeks after he tested positive for marijuana. The landmark case has many medical marijuana users fretting about their employment prospects, legal experts say. But Michigan may be an exception to most states. Part of Michigan's law, passed in 2008, does address employers, saying a patient carrying a medical marijuana card cannot be "denied any right or privilege" by a "business or occupational or professional licensing board." Some attorneys say Michigan's law could be fertile grounds for a discrimination suit. Casias hasn't decided whether he will pursue a lawsuit. Some attorneys say Wal-Mart acted within legal bounds in Casias' termination. Although some states have legalized medical marijuana, the federal government still bans the drug. Many employers like Wal-Mart argue they are following federal guidelines. "It's just an unfortunate situation all around," said Greg Rossiter, a Wal-Mart spokesman. "We are sympathetic to Mr. Casias condition, but like other companies we have to consider overall safety of our customers and associates, including Mr. Cassias, when making a difficult decision like this." James Shore, a labor attorney in Washington who represents employers, says companies are afraid medical marijuana users may perform their job while impaired. "The key thing for employers is to make sure they review their drug testing and human resources policies from top to bottom," Shore said. "They need to make a companywide decision and be consistent about it." Dr. Lester Grinspoon, a professor emeritus at Harvard Medical School, explained the impairment issue: The high from marijuana usually disappears after a few hours. For patients, who medicate with marijuana frequently, they build a higher tolerance against impairment. Casias said he never smoked right before his shifts. He had been using medical marijuana for about four months before he failed the drug test. The debate on whether employers can fire medical marijuana users comes at a time when more states are expected to legalize medical marijuana. At least 16 states are considering the legalizing medical marijuana during this legislative session, according to the National Conference of State Legislatures. Even states once considered to be conservative on drug policies, such as Kansas and Alabama, are reconsidering. The push toward legalizing medical marijuana is gaining clout. Last fall, the American Medical Association asked the federal government to review the classification of marijuana and move the drug into a less restrictive category. The AMA has not taken a position on supporting states that have legalized medical marijuana. A state lawmaker in Colorado this week wants to draft a law that would allow veterans suffering from post-traumatic stress disorder to access medical marijuana with a doctor's permission. Jonathan Hogue, 27, believes the workplace should allow for legalized medical marijuana use. The Portland, Oregon, resident suffers from arthritis and relies on marijuana to ease his back pain. A physician wrote a prescription for him, he says, but a few months ago a nursing job offer was rescinded because of his medical marijuana use. CNN contacted the private nursing company but did not get a response. "It's straight discrimination," Hogue said. "I was trying to be completely honest with them about not trying to hide it because it's not illegal." Supporters of medical marijuana also argue prescription drugs such as Oxycodone can be just as dangerous and widely abused. "If you are a medical marijuana user, you're treated like a drug addict or a second-class citizen," said Douglas Hiatt, a labor attorney in Seattle, Washington, where medical marijuana is legal. 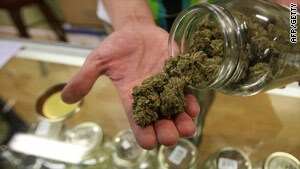 He's encountered dozens of medical marijuana patients who have lost jobs. "What other medicine out there causes this much trouble?" Trouble is what Joseph Casias, a father who needs to support his family, is facing after Wal-Mart let him go. He's already accrued $10,000 of debt from unpaid medical bills. Living on unemployment checks, he constantly worries whether his cancer will get worse since he can no longer afford treatment. This month, a group of supporters have come to his side, holding rallies and forming a Facebook group "Let Joseph Casias Talk." Casias is thankful for all the support, but ultimately, he said, he just wants his job back.